Catholic News World : Pope Francis to German Bishops at Vatican "Find a possibly unanimous arrangement"
Pope Francis to German Bishops at Vatican "Find a possibly unanimous arrangement"
Pope to German Bishops: find possibly unanimous arrangement A group of German Bishops meet in the Vatican for a conversation on pastoral proposals concerning mixed marriages and allowing non-Catholic spouses to receive Holy Communion. By Vatican News At a meeting in the Vatican on Thursday, senior Vatican officials and members of the German Bishops conference held a conversation on a set of pastoral guidelines announced in February. The German Bishops’ Conference at the time approved the development of the guidelines, which would potentially broaden permission for non-Catholic Christians who are married to Catholics to receive Holy Communion. The German Bishops had been called to Rome by Pope Francis after “a not inconsiderable number” of Bishops expressed their opposition to the proposed guidelines. 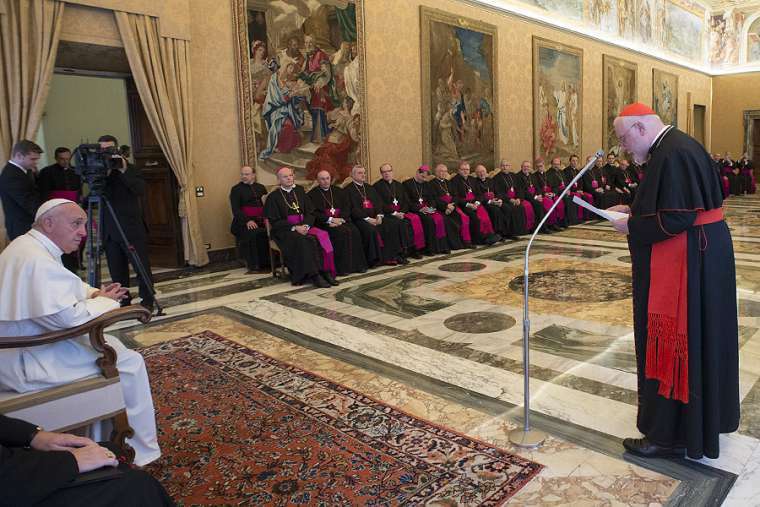 Seven diocesan Bishops appealed to the Congregation for the Doctrine of the Faith, the Pontifical Council for Promoting Christian Unity, and the Pontifical Council for Legislative Texts for clarification. "Find a possibly unanimous arrangement"
During the conversation, which took place in German, the Prefect of the Congregation for the Doctrine of the Faith, Archbishop Luis Ladaria, explained that Pope Francis “appreciates the ecumenical commitment of the German Bishops” and asks them to seek “a possibly unanimous arrangement”. The Press Office statement said that during the meeting, various points of view were discussed, concerning, for example, how the question of extending permission to receive Holy Communion relates to the Faith and to pastoral care; the relevance of the question to the universal Church; and various juridical aspects of the question. “Archbishop Ladaria will inform the Holy Father about the content of the conversation,” the statement said. Thursday’s meeting took place at the seat of the Congregation for the Congregation for the Faith. The following German Bishops were present for the conversation: Cardinal Reinhard Marx, Archbishop of Munich and Freising and President of the German Bishops’ Conference; Cardinal Rainer Maria Woelki, Archbishop of Cologne; Bishop Felix Genn of Münster; Bishop Karl Heinz Wiesemann, Bishop of Speyer and president of the doctrinal commission of the Conference; Bishop Rudolf Voderholzer, Bishop of Regensburg and vice president of the doctrinal commission; Bishop Gerhard Feige, Bishop of Magdeburg and president of the Conference’s commission on ecumenism; and Fr Hans Langendorfer, SJ, secretary of the Bishops’ Conference. In addition to Archbishop Ladaria, the Holy See was represented by Cardinal Kurt Koch, the President of the Pontifical Council for Promoting Christian Unity; Msgr Markus Graulich, SDB, Under-secretary of the Pontifical Council for Legislative Texts; and Fr Hermann Geissler, FSO, head of the office for the Congregation for the Doctrine of the Faith.